<a href="https://twitter.com/MNightShyamalan/status/1012683986613792769" target="_blank"><img src="https://pbs.twimg.com/media/Dg3GpFpX0AAxOXx.jpg" width="95%"></a> <br/> <br/>Long awaited sequel to M. Night Shyamalan's 2000 superhero masterpiece <em>Unbreakable</em> and 2016 thriller <em>Split</em>, which ended with a surprise appearance by Bruce Willis' hero David Dunn. <br/> <br/>Any Unbreakable fans in the house? Long awaited sequel to M. Night Shyamalan's 2000 superhero masterpiece Unbreakable and 2016 thriller Split, which ended with a surprise appearance by Bruce Willis' hero David Dunn. Any Unbreakable fans in the house? 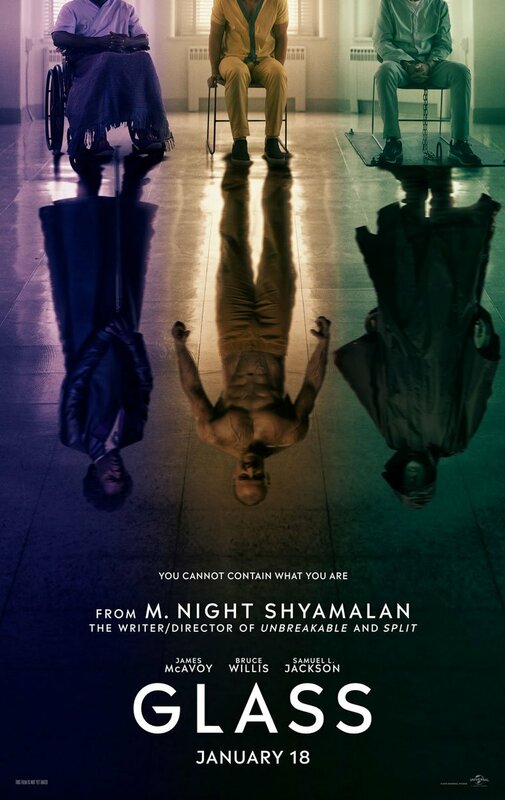 - <strong><a href="http://ew.com/movies/2018/07/12/glass-first-look-james-mcavoy-bruce-willis-samuel-l-jackson/" target="_blank">James McAvoy, Bruce Willis, and Samuel L. Jackson get treated in Glass first look</a></strong> <br/> <br/><img src="https://imagesvc.timeincapp.com/v3/mm/image?url=https%3A%2F%2Fewedit.files.wordpress.com%2F2018%2F07%2Fg_28167382918921092321.jpg" width="95%"> <br/> <br/><img src="https://ewedit.files.wordpress.com/2018/07/g_216t5231231892398123901.jpg" width="95%"> <br/> <br/><em>Shyamalan’s new film, Glass (out Jan. 18), will fulfill the tacit promise of that ending by leading with Willis’ Dunn, Jackson’s Glass (a.k.a. Elijah Price), Taylor-Joy’s Casey Cooke, and the multiple personalities inhabiting McAvoy’s Crumb, both familiar and previously unseen. “We get to spend some time with some new people that live inside Kevin,” McAvoy said. Those are not the only franchise returnees: Charlayne Woodard, who played Elijah’s mom, and Spencer Treat Clark, who played David’s son, also make appearances. “[They] play a big role,” Shyamalan teased to EW. <br/> <br/>At this year’s CinemaCon, a trailer for Glass featured footage of Dunn, Price, and Crumb in the same facility, receiving treatment from a psychiatrist. “She deals with people that think they’re comic-book characters,” Shyamalan said of the doctor, portrayed by Sarah Paulson. “It’s kind of the modern-day equivalent of ‘I think I’m Jesus’ or ‘I’m an emperor.’ ”</em> <br/> <br/>Gang's all here! Anyone see this yet? I haven't been able to go to the movies in months. Was really looking forward to this one despite not being crazy about Split. Unbreakable is excellent, so I was really excited when it was revealed the films were connected. Reviews for Glass have been very negative from what I've seen, but I'd still be willing to give it a shot. The trailer looked solid to me.